Although we all work with SqueakSource every day, it has been in need of some care and attention for some time now. Fortunately, Tobias Pape and colleagues have been working on a total re-work of the SqueakSource code, and have now announced the availability of their first beta of SqueakSource3, named “Easter Fire”. SqueakSource3 is a port of the original SqueakSource to Seaside 3 and Magritte 2. It is based on the original SqueakSource by Lukas Renggli, Adrian Lienhard, and Avi Bryant. • You name it! Suggestions are welcome. SqueakSource3 is expected to run on GemStone/GLASS as well as on squeakish Smalltalks, ie, Pharo and Squeak. This beta has been tested on GemStone 2.4.4.x/GLASS 1.0-beta.8 and Squeak4.2 both with Seaside 3.0.4. Pharo tests are pending. SqueakSource3 incorporates work done in several SqueakSource forks such as access to diffs in a browser as done by Bert Freudenberg for source.squeak.org and a basic issue tracker contributed by Dale Henrichs. Other key contributors to the project include Philippe Marschal, Dale Henrichs, and Gerhard Obermann have contributed much to SqueakSource3. Chris Muller wrote to the squeak-dev mailing list announcing that Magma 1.2 is now released for Squeak 4.2, Pharo 1.1 and Pharo 1.2. Magma is a high-performance, fault-tolerant, multi-user object database that provides transparent access to a large-scale shared persistent object model, supports multiple users concurrently via optimistic locking, and uses a simple transaction protocol. This new release offers bug fixes, new features and improved performance thanks to minimising problems associated with finalisation. In addition, Chris has reviewed and updated the Magma documentation. More information and support is always available from the Magma mailing list. Chris writes that “this release is, exactly, one year since Magma 1.1, thank you for your patience”. Surely it’s us who should be saying thank you to Chris, for his continued work on this valuable project! 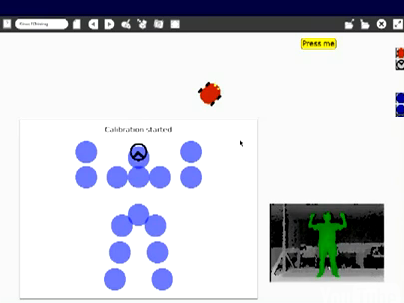 The newly-launched Microsoft Kinect has been causing a lot of excitement in hacker circles since its recent launch, due to its open interfaces, and the Smalltalk community has already got some great uses of this device. 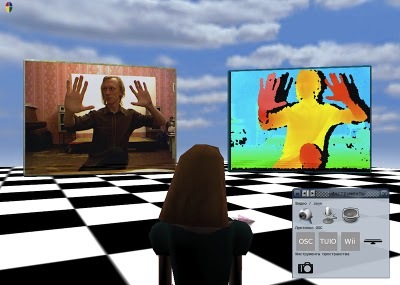 The Kinect is a device, intended to be used as an accessory for the X-Box, which interprets 3D scene information from a continuously-projected infrared structured light, allowing live controller-less interaction by interpretation of movement and posture. This makes it a great complement to existing project teams working in Smalltalk. Ricardo Moran was a member of the team from the Grupo de Investigación en Robótica Autónoma at CAETI in Argentina who won the 2010 ESUG Innovation Technology Awards with Physical Etoys, their Arduino-based interface to Squeak which allowed them to monitor and control robots as they drove round the conference hall. They spent their prize money wisely, buying a Kinect! Building on the work done by Stephen Howell in getting the Kinect working with Scratch (a visual programming environment developed at MIT), they have now shown how to use the Kinect to control activities in Etoys, using the existing OSCeleton framework to provide the skeleton interpretation interface. Their approach is documented in more detail on their blog. Another approach to integrating data from the Kinect is that taken in Nikolay Suslov’s separate and equally impressive implementation which uses the lower-level OpenKinect driver to access the raw colour and depth information and pass this into his bespoke Krestianstvo images, where he then does the detailed video processing and interpretation in Smalltalk, which reduces his reliance on external, platform-specific code. His blog gives more details of his implementation as well as source code, and pre-built images. Chris Muller has recently updated Connectors to work with Squeak 4.2 images. Connectors gives you the ability to turn Morphic into a drawing environment for making connected diagrams. This tool was developed by Ned Konz many years ago and hasn’t been able to load in an up-to-date image for some time. A Connector is a Morph that looks like a line and has a constraint on either end that keeps the ends attached to some other Morph. You can specify properties such as width, borders, fills, end-decorations for each connector, as well as determining the path the connector takes and what labels it should have. The package also comes with other tools to aid in the creation of smart drawings. See the tutorial for more information. The updated package is available on SqueakSource. Following some last minute work at this year’s second Camp Smalltalk event, the Seaside developers are pleased to announce the release of Seaside 3.0 on the eve of the ESUG 2010 Conference in Barcelona. Seaside has undergone a total overhaul, with many classes having been refactored to reduce complexity, decrease coupling, and improve flexibility. The packages in Seaside are now cleanly defined with clear relationships and interdependencies, allowing you to load only those pieces you require. There are improvements in testing, in portability and in performance, as well as much better tools for developers including the Seaside Control Panel for Pharo and Squeak, and the web-based administration interface. Following on from the recent release of the Seaside release candidate for 3.0, a Squeak “One-Click” image has been put together to allow you to try out the new version with—er—one click! 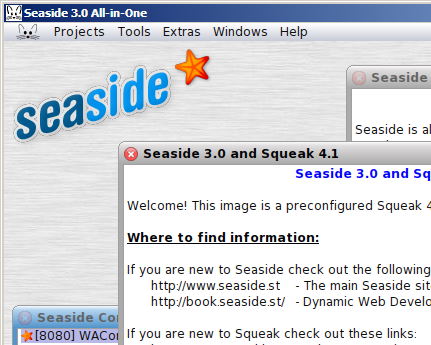 The new image is based on Squeak 4.1, and launches fully configured with Seaside running with Comanche on port 8080, so you can immediately see the new improved Seaside welcome page at http://localhost:8080/, with links to documentation and the Seaside book. 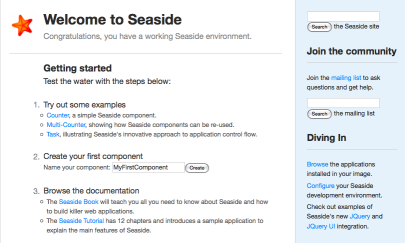 Seaside’s 3.0 release is faster, cleaner, better tested and has many other changes and improvements over previous releases, so it’s well worth checking out this release candidate now.